Bruce Bushman was a designer whose name you may not know, but whose work you've almost certainly seen. He worked on everything from the design of the Disneyland castle to episodes of The Flintstones TV show. 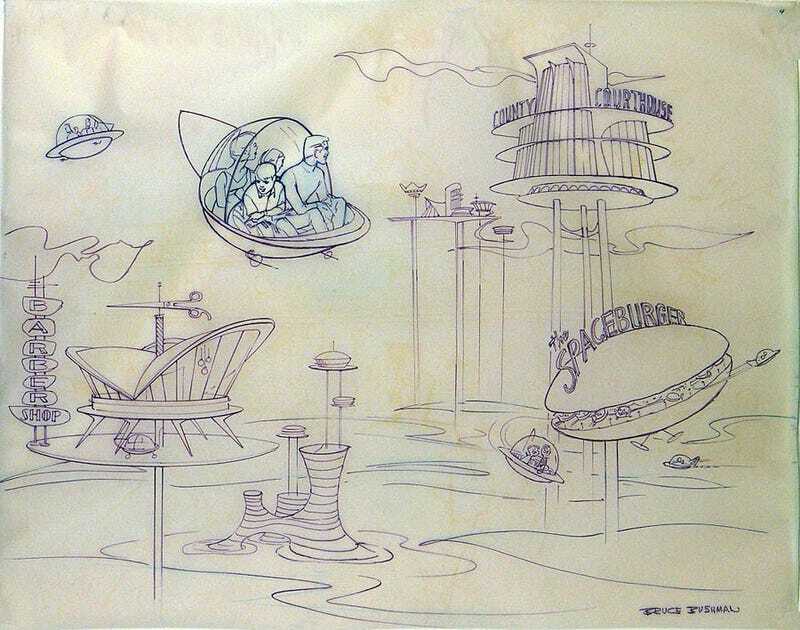 But there's one project that Bushman worked on that sadly never became a reality: a Jetsons theme park ride. Bushman started at Disney as a layout and design artist in the late 1930s, working on films that spanned from Fantasia (1940) to 20,000 Leagues Under the Sea (1954). He also worked on projects like the sets and logos for the Mickey Mouse Club TV show and some of the original rides for Disneyland. But by the late 1950s Bushman left Disney and eventually worked as an art director for Hanna-Barbera, influencing designs for everything from Johnny Quest to The Jetsons. In the late 1960s, Bushman worked on concept drawings for a theme park that was never built. It was to be based on Hanna-Barbera characters, and his designs even include one ride that will leave retro-future nerds drooling. That ride was going to transport visitors into the futuristic, Googie-drenched world of The Jetsons. Just one concept drawing of the ride is known to exist and was auctioned off as part of a larger series of theme park drawings by Bushman a few years back. Sadly, the great artwork Bushman did for this hypothetical Jetsons ride (along with so many others) would never be transformed into real world attractions. Something called Hanna-Barbera Land was indeed built in Texas during the early 80s, but it was nothing as elaborate as the Bushman sketches. The real world Hanna-Barbera themed park also, most tragically, didn't include a Jetsons ride. Below, a 1984 commercial for the ill-fated amusement park, which would be stripped of its Hanna-Barbera branding after just a few short years. The closest thing to a Jetsons ride that the world ever saw was a simulator ride in Orlando that included Jetsons characters in a minor way as part of the storyline — far from the immersive experience Bushman would have wanted, it's safe to say. Bushman died in 1972 at the age of 60. We're thankful for all of the fantastic projects he contributed to but we'll always wonder what that Jetsons ride might have looked like in real life. Perhaps the closest we'll ever get is by watching the second episode of the classic TV show, the one where the Jetson family themselves went to an amusement park.